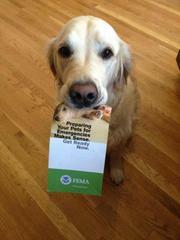 •	Find a Place for your Pet - Never evacuate without your pets. Make sure you have a predetermined place you and your pets can go in the case of an evacuation because not all shelter or other designated places of refuge will allow pets. •	Pet Emergency Kit - Along with an emergency preparedness kit for your household, it is also a good idea to create one for your pets. Some items to include are: a pet first-aid kit, enough food and water to last 3-7 days and toys to keep your pet occupied.